"A hurricane party” hardly refers to a celebration involving University of Miami sports teams in the new, clever, satirical comedy Firemen are Rarely Necessary, set partly in Miami in a not-too-distant future. Normally when a mammoth hurricane is about to make landfall in a state, you’d expect to hear a grim-voiced governor warning residents to prepare. You don’t expect the state’s chief executive to celebrate with beer, gleefully anticipating the approach of a natural disaster capable of wiping out entire communities. The unexpected is common in Firemen are Rarely Necessary, Theo Reyna’s well-thought-out, scorching, suspenseful, cautionary play. It is having its world premiere in the intimate SandBox stage through July 16. The production is an admirable one by the bold, provocative Miami Shores-based Mad Cat Theatre Company. 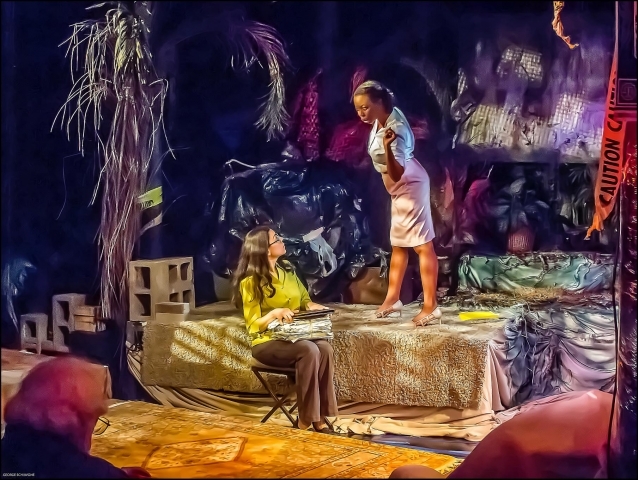 Mad Cat, which takes up residence at the Miami Theater Center, doesn’t shy away from producing thought-provoking, timely, meaty plays. 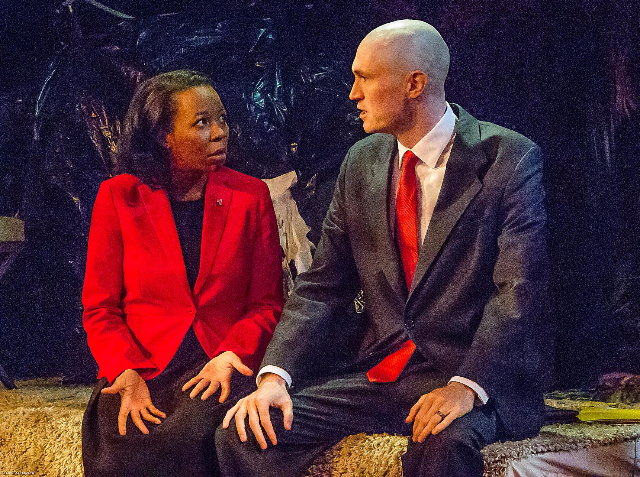 The company highlighted the disturbing, frightening practice of censorship in its production earlier this year of two plays by Czechoslovakian playwright Vaclav Havel: Audience and Protest. These works were once banned in that country’s oppressive Communist regime. Censorship, corruption and tyranny are in the harsh limelight again at Mad Cat. 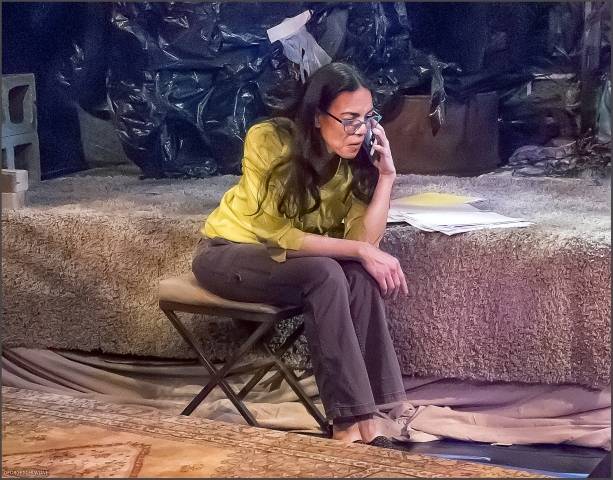 Playwright Reyna turns to darkness to illuminate the often brushed aside issue of climate change/global warming. There’s no question Reyna, who writes snappy, sarcastic and smart dialogue, is prone to exaggeration in his new play. Some of the incidents seem a stretch, to say the least, but they’re intended to jolt us into debate, discussion and hopefully action. The playwright provokes us with this pitch-black comedy without preaching to us. Twists and turns keep the play unpredictable. Its short, pithy scenes emphasize the urgency of issues and make the play as compelling as a page-turner. The action plays out on set designer David Nail’s unkempt tropical, jungle-like setting with leafless trees and an unsightly garbage bag amid furniture. The symbolism behind placing the furniture amid the jungle is clear: We’ve all played a role in the dilapidation of the environment; we live amid such destruction. The playwright, while harsh on government and business officials, doesn’t let us off the hook for being less than ideal stewards of our planet. Reyna’s dialogue, sound designer Matt Corey’s foreboding effects, and designer David Nail’s eerie lighting, possess a blood-curdling effect that, throughout the play’s hopefully long life in the theater, will no doubt make its audiences shiver with a sense of urgency. While there’s some light-hearted humor, much of the comedy will elicit laughter of the squirming variety. How could you not shift uncomfortably in your seat, in a disturbed state, as you watch the following unfold: Climate scientist Mara Lowe-Cumbre’s research and findings about the harmful effects of erosion and wastewater run-off are quashed by corrupt Florida state officials. They are led by a governor who, at one point, requires people to bow down to him as he sits on a throne in his “kingdom” of Tallahassee. The characters in the play might be fiction, but there’s no denying Florida’s chief executive (an arrogant, conspiratorial, maniacal Noah Levine) is a stand-in for Gov. Rick Scott. The play is structured, in part, as a series of supposedly secretive interviews taking place in an undisclosed location between Lowe-Cumbre (played by Deborah L. Sherman with the drive and frustration of a health professional trying to control a large-scale health emergency) and a radio announcer. These interviews are captured through projections suggesting a dark, secretive, claustrophobic meeting place. During flashbacks, we witness the scientist’s efforts to spread awareness about climate change/global warming through a speech and to publish her research findings under a state grant. Censorship by government officials stands in the way. One cannot overstate the timeliness of this play: In other countries, journalists are jailed for merely doing their work. Some fear censorship is a practice bound for the U.S.
It’s little wonder people are grabbing copies of George Orwell’s cautionary, frightening novel 1984. An adaptation of Orwell’s novel about censorship and silencing voices and pens has found its way to Broadway, while another adaptation is set for production by Outre Theatre Company (outretheatre.com) from July 13-30 at the Pompano Beach Cultural Center. Similarities spring to mind between Firemen are Rarely Necessary, 1984 and Ray Bradbury’s Fahrenheit 451, also set in a future in which censorship reigns and firemen are, also well, rarely necessary. That’s because Bradbury envisions a society in which the public leads rather meaningless lives. They don’t think, engage in conversation or read books, which is forbidden. In fact, they’ve forgotten about books, and the government would like to keep the citizenry uninformed and from thinking independently. Just in case one, two or more people are harboring books, firefighters stand ready to burn them. Just as the citizenry that make up Fahrenheit 451’s world don’t seem to care about issues, the same can be said of the public in Reyna’s play. Again, the government would like to keep it that way, and so at least one person of higher power stands ready with matches. In the play, the Tampa branch of an environmental organization is supposedly set aflame following the hurricane by a government official keen on making research findings disappear. We learn that the storm, as powerful as it is, merely broke a window – which seems implausible. Overall, though, Firemen is an engrossing play that illuminates issues that aren’t going away anytime soon. Firemen are Rarely Necessary’s world-premiere production continues through July 16 at the Miami Theater Center, 9816 NE 2nd Ave. in Miami Shores. Performances are 8 p.m. Thursdays through Sundays and tickets are $15-$30. Call (305) 751-9550 or visit www.madcattheatre.org.